In this lesson, we will learn how to solve problems using Newton's second law for a body of variable motion and/or one that is acted upon by a variable force. A body moves in a straight line. At time 𝑡 seconds, its displacement from a fixed point is given by 𝑠 =  6 𝑡 + 9 𝑡   m . Its mass varies with time such that 𝑚 = ( 8 𝑡 + 9 ) k g . Write an expression for the force acting on the body at time 𝑡 . A body moves in a straight line. At time 𝑡 seconds, its displacement from a fixed point is given by 𝑠 =  2 𝑡 + 5 𝑡 + 4   m . Its mass varies with time such that 𝑚 = ( 6 𝑡 + 5 ) k g . Determine the force acting upon the body when 𝑡 = 3 s .
A ball of mass 5 g was moving in a straight line through a medium loaded with dust. The dust was accumulating on its surface at a rate of 1 g/s. Find the magnitude of the force acting on the ball at time 𝑡 = 5 s e c o n d s , given that the displacement of the ball is expressed by the relation ⃑ 𝑠 ( 𝑡 ) =  2 3 𝑡 + 𝑡 + 7 𝑡 + 1  ⃑ 𝑐 3 2 , where ⃑ 𝑐 is a unit vector in the direction of the motion and the displacement is measured in centimetres. A body of mass 6 kg is initially at rest at a point 𝑂 . It starts to move under the action of a force 𝐹 ( 𝑥 ) = ( 2 𝑥 + 8 ) N where 𝑥 m is the displacement of the body from 𝑂 . Find the displacement of the body when its velocity is 𝑣 = 4 / m s .
A body of mass 2 kg moves along a straight line under the action of a force, 𝐹 . The force acting on the body is 𝐹 = ( 9 𝑥 + 7 ) N, where 𝑥 is the displacement of the body from its initial position. Determine velocity of the body when 𝑥 = 4 m .
A body moves in a straight line under the action of a force, 𝐹 =  2 5 𝑣 + 3  N , where 𝑣 is the velocity of the body at time 𝑡 seconds. If the initial velocity of the body is 3 m/s, at what time does the body reach a speed of 7 m/s? The mass of a body at time 𝑡 is given by 𝑚 ( 𝑡 ) = ( 2 𝑡 + 1 2 ) k g , whereas its position vector is ⃑ 𝑟 ( 𝑡 ) =  2 𝑡 + 3 𝑡 + 1 5  ⃑ 𝑐 2 , where ⃑ 𝑐 is a constant unit vector, ⃑ 𝑟 is measured in metres, and 𝑡 is measured in seconds. Find the magnitude of the force acting on the body at 𝑡 = 2 seconds. A metal ball of mass 220 g was moving in a straight line at 10 m/s through a dusty medium. If it was free from dust at the start of its motion, and the dust adhered to its surface at rate of 0.06 g/s, find the mass of the ball 𝑚 and the force 𝐹 acting on it at any given time 𝑡 . A ball of mass 9 g was moving in a straight line on a dusty plane. The dust was accumulating on the ball’s surface at 2 g/s. The ball’s displacement is expressed by the relation s c ( 𝑡 ) =  𝑡 + 3 𝑡 + 7 𝑡 + 2    , where c is the unit vector in its direction of motion, 𝑡 is the time in seconds, and the magnitude of the displacement is measured in centimetres. 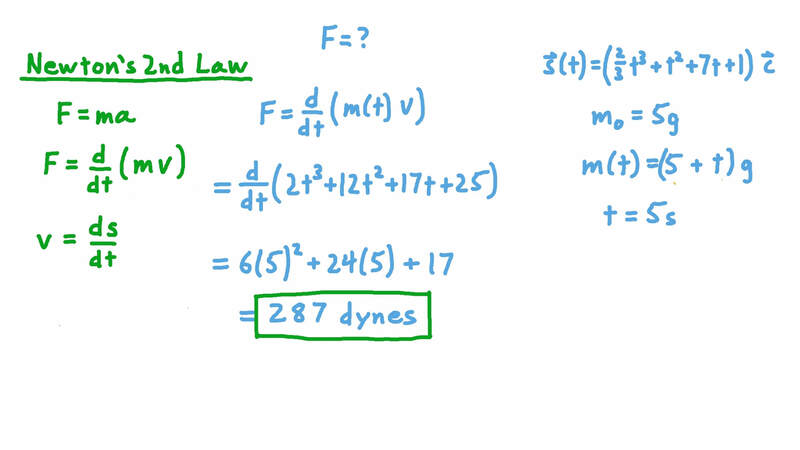 Determine the force vector at time 𝑡 , given that its magnitude is measured in dynes. A body of mass 20 kg started moving from rest along the 𝑥 -axis. When the body’s displacement relative to the origin was 𝑠 m in the direction of 𝑥 increasing, it moved under the effect of a force given by 𝐹 = ( 1 0 𝑠 + 5 ) N . Find the body’s velocity at 𝑠 = 8 m .
A body of mass 11 kg started moving along the 𝑥 -axis at an initial velocity 8 m/s in the direction of 𝑥 increasing. After time 𝑡 seconds, where 𝑡 ≥ 0 , the body’s velocity was 𝑣 m/s in the same direction, and the force acting on the body was 𝐹 =  4 6 𝑣 + 6  N . Determine the value of 𝑡 at which 𝑣 = 1 0 / m s .
A ball of mass 22 g was moving in a straight line through a medium loaded with dust. The dust was accumulating on its surface at a rate of 2 g/s. Find the magnitude of the force acting on the ball at time 𝑡 = 2 s e c o n d s , given that the displacement of the ball is expressed by the relation ⃑ 𝑠 ( 𝑡 ) =  1 3 𝑡 + 2 𝑡 + 𝑡 + 8  ⃑ 𝑐 3 2 , where ⃑ 𝑐 is a unit vector in the direction of the motion and the displacement is measured in centimetres. The mass of a body at time 𝑡 is given by 𝑚 ( 𝑡 ) = ( 3 𝑡 + 1 0 ) k g , whereas its position vector is ⃑ 𝑟 ( 𝑡 ) =  2 𝑡 + 2 𝑡 + 1 3  ⃑ 𝑐 2 , where ⃑ 𝑐 is a constant unit vector, ⃑ 𝑟 is measured in metres, and 𝑡 is measured in seconds. Find the magnitude of the force acting on the body at 𝑡 = 2 seconds. A metal ball of mass 104 g was moving in a straight line at 6 m/s through a dusty medium. If it was free from dust at the start of its motion, and the dust adhered to its surface at rate of 0.08 g/s, find the mass of the ball 𝑚 and the force 𝐹 acting on it at any given time 𝑡 . A body moves in a straight line. At time 𝑡 seconds, its displacement from a fixed point is given by 𝑠 =  3 𝑡 + 8 𝑡 + 7   m . Its mass varies with time such that 𝑚 = ( 5 𝑡 + 4 ) k g . Determine the force acting upon the body when 𝑡 = 4 s .
A body moves in a straight line. At time 𝑡 seconds, its displacement from a fixed point is given by 𝑠 =  6 𝑡 + 2 𝑡   m . Its mass varies with time such that 𝑚 = ( 5 𝑡 + 3 ) k g . Write an expression for the force acting on the body at time 𝑡 .